Thirty four years ago, I had just started my first marketing agency and within a few weeks I had a call from one Paddy O’Farrell. Paddy was running sales and marketing for a small division of Ericsson at the time and was looking for marketing help. I remember the phone call because I was in Stoke-on-Trent in Staffordshire, Paddy was in Coventry. He asked me how long it took to drive between the two places. I told him and he said, “I’ll see you in an hour and a half then.” No ifs, no buts. We then worked together for six years before he left Ericsson and life took him in a completely different direction. We had become good friends during that time but, as so often happens in the craziness of everyday life, we lost touch. I think we last met at his house in 1990 and for the last 13 years he has lived with his wife, Fay, in Malaga. The point of this narrative is that Paddy and I connected on Facebook a while back and when he read that I was planning a cycling trip to Spain he asked if I would be anywhere near Malaga. I wasn’t going to be and in any case Paddy was holidaying in Tenerife during my trip. When I decided to come to Tenerife, I got in touch and we agreed to meet for lunch yesterday (Monday), together with Fay, their son Antony and Antony’s partner, Lisa. Hence my assault on El Teide would wait until Monday. Before lunch, I took a short ride the check out the bike, after taking it out of the box and putting various bits back together because it had been partly dismantled. Traffic was busy and on far too many occasions drivers were either inconsiderate or downright dangerous. I really can’t recommend Tenerife as a place for cyclists, despite the climate. My experience of France, mainland Spain and even the UK has been infinitely better. Nevertheless, I managed a loop of twenty-odd miles without serious injury and felt that this was enough to put me in good shape for the next day’s challenge. Lunch in the little port of Los Abrigos was delightful with great food, great conversation and modest consumption of wine. I had wanted to tell Paddy that Ericsson remained a client for 33 years, until the end of 2017, at which time the division in question was sold to another global company called Flex. Despite that, Flex immediately hired our agency to continue the work. Paddy’s phone call to me in 1984 had initiated a business relationship that has lasted 34 years and picking up the bill for lunch was the very least I could do to thank him. Lunch with Paddy, Fay, Antony and Lisa. The best possible start to my brief trip to Tenerife. I set off to climb El Teide at 7:20 this morning, while it was nice and cool. After ploughing through Monday morning traffic near the coast, I went through several small towns and, because I took the most direct route offered by Google Maps, ended up on one stretch of road that was so steep I could not turn the pedals and had to push the bike for about 500 metres. I thought to myself that if the whole route was going to be like this, I’d never make it. My fears were unfounded though and I soon began to settle into the climb, reaching an approximate mid-way point of Vilaflor at about 10:30. I refuelled there with a sandwich, apple tart and water, rested for about 20 minutes and then set out to do the last and most testing 25km of the climb along TF-21. I saw a few other cyclists, mostly brief glimpses of their backs, and pushed on slowly through the pine forest. It was reminiscent of Mont Ventoux. Of course, it was tough going but no more so than I had expected. The scenery was breathtaking, as was the oxygen-depleted air. There was absolutely no risk of rain because the clouds were below me. I don’t know of any recorded incidence of clouds raining in an upwards direction, but I’m sure someone can enlighten me! The peak of the climb arrived suddenly and earlier than expected. I passed a sign for “El Teida” but it’s a national park, not a precise point on the map. In retrospect, I think I could have turned around and gone home at that point, my goal achieved but I kept going and there was a long descent into a kind of valley followed by a climb up to the park’s visitor centre. Arrival! The “lucky” socks were chosen for me by my daughter, Matilda, obviously without knowledge of VC Walcot´s club jersey colours! I chatted with a couple of cyclists from the north east of England. They thought that we had topped-out by this point so I turned around and headed back the way I had come, including climbing back up the long descent I’d enjoyed less than an hour earlier. I strayed from my intended route on the way back down and added a few kilometres to the ride but with my target achieved, it just didn’t matter. I arrived back at my accommodation at 16:20 having covered a total distance of 64.1 miles and climbed 10,598 feet, most of it in half that mileage, of course. My average speed was a miserly 8.9mph but I was pleased with that under the circumstances. Dinner tonight is at Chez Paddy, with Anthony doing the cooking. I’m sure it’ll be the perfect end to this trip. For this trip, I planned to stay in reasonably large towns, wherever possible. When I rode to Barcelona from home last year, in the great company of my friend Richard Stanton, we nearly found ourselves without a roof over our heads at night on more than one occassion. I didn’t want a repeat of that situation while on my own in the sierras of Spain. In larger towns or cities, there’s usually somewhere to stay. The next two big places north of Cáceres are Plasencia, about 50 miles away, and Salamanca, another 80 miles further north. With a great day’s riding behind me, I thought that Plasencia would be a good place to stay yesterday evening (Friday), and I would then continue to Salamanca for Saturday. Then I looked up the weather forecasts. Friday was getting cooler and showers were promised again. No problem. But the forecast for Salamanca on Saturday was grim. It would be below freezing the morning only rising to a balmy 6 degrees C at mid afternoon. Worse still, both rain and snow were predicted. Now, I’m usually up for a biking challenge but this had the potential to become both a miserable and potentially dangerous ride. I was supposed to be here to enjoy myself and even at home I draw the line at riding in snow. It was time for a rethink. I considered cutting the trip short but after a chat with my wife Sally, back in the freezing UK, decided to explore other options. The bicycle was caused by a volcanco. (I know that’s a dramatic change of subject but bear with me, your honour, it is relevant to the case.) Two hundred and three years ago next month, Mount Tambora in Indonesia exploded in the biggest eruption ever recorded. It diminished in height by nearly 5,000 feet while projecting 24 cubic miles of ash and rock skywards. Krakatoa was a minor “pop” in comparison. The result was a dramatic fall in temperatures around the world, crop failures, and disease and death on a massive scale. One year later, in 1816, Baron von Drais, a forestry manager in Baden, Germany, figured out that you could balance on a log with one wheel at the front and one at the back, steering with the one at the front. Nobody knows quite why he did it but it was probably related to the shortage of horses, most of which had been eaten in response to the drought and subsequent food shortages caused by Tambora’s eruption. Maybe he wanted a new way to move logs, maybe he wanted something to ride and couldn’t find a horse in one piece. Regardless, he had invented the “Draisine” or “Hobby Horse”, the forerunner of all modern bicycles. Even if you have no interest in bicycles at all, I recommend the book “Re:Cyclists – 200 Years on Two Wheels”, a brilliant, fact-filled book by Michael Hutchinson that describes the numerous social revolutions, including women’s emancipation, that were directly influenced, if not driven by the development of the bicycle. So, back to Cáceres. I did a bit more weather research, both for Spain and the south of France, thinking that I might find a way to get to somewhere more hospitable. Everywhere looked a bit cool and unreliable due to cold weather heading in from the east. Then I remembered another volcano, Teide. This is the dormant one that dominates the largest of Spain’s Canary Islands, Tenerife, off the west coast of Africa. It’s a Mecca for cyclists, amateur and professional alike, and the climb up Teide is one of the classics, right up there with Alpe d’Huez and the formidable Mont Ventoux, both of which I had gasped up a couple of years earlier with my good friend Byron Wheeler and his then seventeen-year-old son. I holidayed in Tenerife with my family about three years ago and since then had it in the back of my mind to tackle Teide one day. After checking out the weather for the next few days, which was going to be aroud 19 or 20 degrees C and mostly sunny, this suddenly seemed like too good an opportunity to miss. The new goal of the trip was not the north coast of Spain but the highest point of the road on Monte Teide, Tenerife. I switched my Easyjet flight from Bilbao to Bristol to one from Tenerife to Bristol next Tuesday evening, booked a cheap flight (113 Euros) with Iberia from Madrid to Tenerife and set about figuring out how to get to Madrid with the bike. By the way, Iberia does its best but is not exactly bike friendly. You pay for your flight before they confirm that they can take the bike. Then they check – I don’t know with whom – and send a second confirmation an hour later to confirm that the bike can travel with you. You can’t pay the 45 Euros for the bike over the phone or online. You need to make a separate trip the “customer service” desk at the airport to hand over payment. It seems to me that most companies with “customer service” departments fail to deliver what customers need, but that may be an age-related perception. I loaded up my bike at the hotel in Cáceres on Friday morning, asked Google Maps to direct me to the nearest bike shop and half an hour later arrived at “La Bicicleta”. I needed something to put the bike in so that I could either take it by train to Madrid or into a rental car and then onto a plane. I was greeted by a young and enthusiastic mechanic by the name of Jesus. Jesus didn’t speak much English but explained that his colleague, a German guy called Raphael did, and that Raphael would arrive soon. A few minutes later Raphael arrived, declared that because I was British we must be enemies (what a memory), and told me that he didn’t have bike bags in stock but that he could partly dismantle my bike and put it into a cardboard box for one million Euros. Twenty seconds later we had renegotiated that down to a mutually acceptable 20 Euros. Rafael then told me that Europcar, a few hundred metres away, was the best place for car rental and that if I mentioned his name I would get a discount. He was right and Juan at Europcar, himself a keen cyclist, could not have been more helpful. He offered a choice of cars at a lower rate than I could find online then drove me back to La Bicicleta to make sure the bike box would fit into the car. Jesus helped me bundle it in and I set off for the 300km journey to Madrid. I knew that I wouldn’t have the energy for sight-seeing so I booked into a Marriott airport hotel, and had a great dinner in the restaurant, followed by early night. This morning it was 4C and raining heavily in Madrid. After a huge detour to fill up the rental car with fuel, I managed to find Europcar rental returns at terminal 1, although I was looking for the same at terminal 4, dragged bike and luggage onto the transfer bus and checked in at the aiport. Then, for the first time in my life, I went through both security and passport control twice. I don’t know how that happened but I eventually ended up at the right gate and had an unevenfull flight to Tenerife North Airport and a smooth pre-booked transfer to my accommodation on the south coast. My plan is to ride up Teide on Monday as the final leg of this trip. It should be interesting. After Ventoux and Alpe d´Huez I said I’d never do really big climbs again – they’re just too demanding. Alpe d’Huez rises through twenty-one numbered switchbacks to 1,860 metres above sea level; Mont Ventoux becomes a virtual moonscape, peaking at 1,912 metres. The road to Teide reaches 2,190 metres, by far the highest I will ever have climbed. In fact the top of the volcano is at 3,781 metres, but only accessible by cable car. Here’s a nice description of one of several routes to the top. I may not have reached the original destination of this trip but Teide is a bucket-list climb that I hope to check off the list on Monday. Of course, I could ride up the volcano on Sunday (today, by the time I finish this post and you read it), but there’s a reason that goes back 34 years why I won’t be doing that. I’ll explain tomorrow. I’m in a hotel on at Madrid airport. Those of you who know Spain will realise that Madrid is a long way east of my intended route. This is what’s happened since yesterday morning. It was chilly and damp as I left the Hotel Leo just after 8am. The first of the day’s “showers” started 15 minutes later. I left the Hotel Leo in Monesterio at just gone eight o’clock after a breakfast of toast, jam and coffee. The weather forecast was for showers so it was no surprise that a heavy downpour started about 15 minutes after I set out. I donned the waterproofs and carried on pedalling to the sound of skylarks, which were to be seen in the fields either side of me. The sky looked totally black and I thought I was in for hours of getting drenched again but things brightened up after 20 minutes and there were occasional glimpses of sun. The road was a little busier than yesterday but not unduly so. There were none of the huge climbs of the day before, just a gently undulating terrain which masked what was in fact a gradual descent of nearly 2000 feet over the first 60 miles of the day’s riding. I was a little concerned about the strengthening sun so stopped to buy sun cream and a coffe in a pretty town called Villafranca de los Barros. It was full of smart little shops for tourists and was immaculately clean, unlike many of the smaller, more industrial places I had passed along the way. Preparing to leave the town, I applied plenty of sun protection then took off my waterproofs and stashed them neatly on top of my rear bag. The heavens opened five minutes later and I scrambled to put everything back on before I got wet on the inside. Once again, there appeared to be no likely end to the rain but 20 minutes later it was gone and the day became brighter once more. The road from Villafranca de los Barros to Mérida was busy traffic was still not problematic, with the possible exception of the odd truck getting a bit close. The wind seemed to be coming from a more westerly direction and it was testing at times when the road veered towards the west, or when I was in the middle of a squall, two more of which were still to come. I stopped just south of Mérida for a light lunch and a beer at a roadside bar. I had already covered 60 miles, more than my total for the day before, and I began to wonder if I might make it to the next significant city, Cáceres, over 40 miles further north. Looking at my map – the printed one – I could see lots of green areas ahead, which I took to be hills, although there were no contours to give me a clear indication of the steepness or otherwise of the route. However, at no point did the road seem to be meandering in those tight little squiggles that suggest a straight line was not an option for its builder due to the steep nature of the terrain. Mérida has some fine Roman architecture in the old part of the city and I was tempted to book in somewhere and take a look around. In the end, I decided to try to add some extra miles while the weather was being relatively kind. I pressed on and started climbing steadily. The traffic disappeared almost totally. I once again saw a stork nest on a pylon (just the one this time) and my path was frequently crossed but the pilgrims’ walking route, the Camino De Santiago. You can cycle along this too but much of it would demand a mountain bike, which mine isn’t. When you ride long distances, tiredness isn’t a linear thing. You don’t just get more and more tired, it comes on in waves, and some of the dips make you wonder if you can even turn the pedals just one more time. As I reached the 83-mile mark, one of these deep dips hit me. I’ll pulled over to a garage and, in the absence of sandwiches, bought and ate a full packet of chocolate doughnut shaped things, all 496 kcals of them. They were rather disgusting but did the job. I topped up with water and got back on the bike. Cáceres was the goal but I didn’t yet have the confidence to book into the really nice-looking hotel I had seen on booking.com because I didn’t know if the weather or hills would yet get the better of me. A few kilometres further on, standing in the sunshine, I took the plunge, booking a room in the four-star Gran Hotel Don Manuel for a mere 75 Euros. I was confident of getting there. Within five minutes the sky went completely black and I found myself riding into a massive headwind and near-horizontal rain. This was the third “shower” of the day and I told myself if it didn’t stop soon I’d be checking into the first available shelter! Shortly after, the weather cleared again, I couldn’t see any mountains ahead and I ploughed on. With nearly 100 miles under my belt I was feeling good to the point of standing on the pedals on some of the climbs and pushing ahead enthusiastically. The final shower came just as I entered the outskirts of Cáceres, too late to cause any concern. I checked into the hotel, which was as good as it looked in the photographs, my only complaint being that the heated towel rail didn’t work, so I couldn’t dry my wet clothes. Apparently that was the case throughout the hotel, which seemed odd. A maid appeared promptly, took the wet stuff away and brought it back dry and neatly folded about an hour later. There was no charge. I had covered 107.5 miles and was ready for dinner. I wandered into a nearby classical town square and had the set meal at a local restaurant after waiting 40 minutes for it to open at 8:30pm. Even that’s early for some restaurants in Spain. It rained again, so much so that I moved from under a leaking umbrella to a nice, dry inside table. Back at the hotel, I started researching the next couple of days’ travel. The result of that research brought me Madrid today. More about that in tomorrow’s post. Two things I forget to mention yesterday: storks nesting on top of high voltage pylons and bull fighting. The former were frequently visible on the road from Huelva to Seville. How enterprising of the storks to adapt these man-made monstrosities for their own use. And speaking of monstrosities, there’s the bull fighting. It was on the television in the bar where I stopped for tapa and a glass of vino tinto yesterday evening. I´m amazed and disappointed that Spanish society hasn’t seen fit to totally ban the barbaric practice of taunting and maiming dumb animals in the name of ‘sport’. Onto today. The forecast was for rain and this time it was unequivocally accurate. I set off in the rain from the rather splendid Vincci La Rabida Hotel in the middle of Seville, using Google Maps to navigate my way to the N630, or Ruta de la Plata. As I mentioned yesterday, the N630 will take me all the way to the north coast of Spain and it announced the fact by stating on a signpost at the outskirts of Seville that I had just 804km to go. Road signs every kilometre count down the distance. It’s a grey, wet day but this one road will take me all the way from Seville to the north coast of Spain, so at least navigation shouldn’t be too much of a challenge. For a few miles it was quite flat. The wind was coming from a WSW direction. When you’re cycling long distances, wind direction is surprisingly important. Even a 4mph headwind can make progress noticeably more demanding, whereas a 4mph tailwind can make life a breeze, if you´ll excuse the pun. According to the forecast, today’s wind speed would involve gusts of up to 45km per hour. Combine that with persistent rain from mid-morning, my overweight luggage and the undulating landscape of the sierras of south-east Spain (I´ll need to look up the name for the particular range of hills I traversed) and you have the perfect recipe for a reasonably challenging day´s slog on a bike. I knew something was making me tired after such a relatively short ride. I remember that downhill bit after 23 miles, and the price you have to pay for having fun! As I mentioned, wind direction is incredibly important to cyclists. Edward Enfield, father of comedian Harry Enfield, has written several books about cycling round Europe, some of which I’ve read. What he said about headwinds struck a particular chord with me. This is the sentiment, although it may not be what he wrote word-for-word: “You can conquer a hill but a headwind grinds you down and eats into your soul.” And it’s true. The WSW wind today helped me more that it hindered but when the road veered north-west the crosswind was testing. When I rounded bends to the right and was travelling north-east, I didn’t even need to pedal. In the sunshine, this would have been a completely different ride. The N630 is the Marie Celeste of major roads: it’s almost eerie in its emptiness. The parallel free motorway takes most of the traffic. On some stretches I would only see a car every 30 minutes or so. It was safe cycling. Even those drivers that did overtake me gave a me huge amount of space and were amazingly considerate. Contrast that with the UK where the microJoule of energy needed to turn a car steering wheel an inch to the right to give a cyclist a little more space when overtaking seems to be beyond the effort that many motorists are prepared to exert. For the record, the Highway Code states that cars should allow a gap of 1.5 metres when overtaking, not 1.5 feet. I had made a reservation at the Hotel Leo in Monesterio, some 60 miles north of Seville, but was quite prepared to carry on to Zafra, a further 30 miles north, if I felt up to the task. However, by the time I got to Monesterio I was tired and soaking wet, my best “waterproofs” having been overcome by the repeated deluges driven into every tiny gap by the wind. I parked the bike in the basement and headed up to my room. To my delight, there was a heated towel rail in the bathroom, which meant that I could dry today´s attire and wash some more clothes too, knowing they would be dry before morning. The alternative solution, drying clothes with a hair dryer is a long winded process! This is Ibérico ham country and there´s a museum dedicated to it in Monesterio, about a mile back on the other side of town. I had not intention of venturing out again in the rain so decided to skip the experience this time around. The bar-restaurant of the hotel offered a phenomenal selection of ham dishes, so I had the lamb. Very nice it was too. Vegetarians, please look away now. This simple but substantial lunch was just what I needed. Washed down with a glass of red wine and a café con leche, lunch was followed by a rare afternoon nap. I can’t remember the last time I had one of those but I think I could get used to it. I’ve been researching the route profile for tomorrow but can’t find it yet. The weather forecast is for showers, rather then persistent rain, and it will be a little cooler, around 14C. The town of Merida is about 60 miles away, so that’s a potential destination if the riding is hard again but I’ll try to put in a few more miles if I’m still feeling on form by the time I get there. Despite missing my family back home, which I do a lot, I love my cycling and the phenomenal sense of freedom it engenders. Hard days like today can test that love but I know that tomorrow morning I’ll be as eager as ever to get back into the saddle and full of optimism and excitement about the day ahead. Onwards and upwards, but not too much of the latter, I hope. Time for dinner. It’s Tuesday evening and I’m sitting in my hotel room in Seville, having wandered around the city looking for a small Bluetooth keyboard for my iPad. The original decided to die sometime between the last time I used it – some months ago – and when I arrived into Faro, hence the lack of blog post for two days. My first major concern for this trip was how to get the bike over safely. I do have a nice, sturdy bike box for airline travel. I didn’t have anywhere to put it if I’d brought it to Faro. I decided to resort to putting the bike into a big plastic bag so that baggage handlers could see what it was. Online opinions about the wisdom of such packaging vary from “it’s always worked for me” to “you have to be out of your tiny mind!”. The latter was from an ex-airline pilot, so he should know. Anyway, the upside of the plastic bag transport system is that you don’t have to disassemble the bike very much, so it doesn’t take long to put it back together. The task is made even easier at Faro airport because the baggage reclaim area has bike reassembly stations – two in the case of the one I flew into. These each consist of a bicycle stand, pump and pedal spanner. I had padded the bike with foam sheets and pipe lagging, held together with reusable cable ties (they them, they’re really good), and it arrived totally unscathed from the journey. I put all the packaging in the bin at the airport and now just have to figure out what to put the bike in to take it home when the time comes. After getting everything loaded up – and I really can’t understand how the bags came to be so heavy – I rode the short distance to the 3K Hotel on the aiport, grabbed something for dinner at the adjacent supermarket (the hotel restaurant was closed) and had an early night. 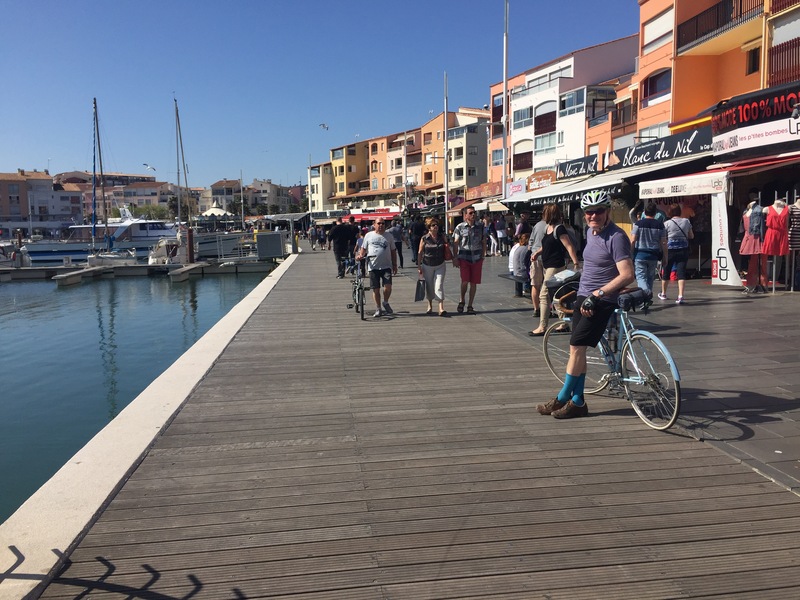 I set out off at seven-thirty, rode through Faro and tried to locate a coastal cycleway that’s rumoured to run to the Spanish border. Along the 50 miles or so to said border, I encounted the route a few times but kept ending up back on the N125, the signposts for the cyleway being less than adquate. The landscape was mostly flat, I had a tailwind to push me along and for the most part, the cycling was reasonably easy. There were flamingos in the coastal lagoons, guard dogs barking from behind mesh fences at many of the more rural properties, orange groves a-plenty, and graffiti in even greater abundance. I spotted the ultimate confusing sign while searching for the ferry in Vila Real de Santo António to take me across to Spain. After a short and uneventful crossing, I carried on heading east, deciding to go north around the industrial city of Huelva to avoid the worst of the traffic and main roads. I arrived at my small hotel in San Juan del Puerto (a town that has little to commend it) around five-thirty in the afternoon, having covered about 95 miles, the last fifteen of which were becoming hard work, not least because I thought the journey was only going to be 80 miles but there was a miscalculation somewhere. The Hostal Toscana was clean, the welcome warm, the restaurant non-existent. I found a bar close by and finished off the day with chicken and chips and a couple of glasses of fine Rioja. Today, knowing that I only had 50 miles or so to cover, I luxuriated in a late breakfast at a cafe across the road from my hotel. I then took the A472 to Sanlúcar la Mayor, about 20 miles west of Seville. The A472 was a delight. It’s a quiet road because it runs parallel with a motorway, so there’s little heavy traffic. There was a wide shoulder to ride on for most of the way and it was free of the gravel, broken glass and road-kill that so often blights these lanes on British roads. The long ascent up to Sanlúcar la Mayor gave me a taste of what’s to come as I head north tomorrow. With a heavily laden bike, I was into my lowest gear and wishing I had a few more that were lower still. I know that there will be many similar climbs in the coming days. Both yesterday and today, rain was forecast but didn’t materialise. Yesterday was quite cool, I guess around 14C, but today reached 20C and the sun even came out for a while as I approached Seville. I took a stroll around for a couple of hours and finally managed to find a replacement keyboard for the iPad. That’s what I’m typing on now. However, it’s a Spanish one with several of the keys in different places from those on a British keyboard. Add auto-correct to that and I’m almost certainly writing more rubbish than usual! Seville is beautiful and a few iPhone photographs can’t do it justice, but here they are anyway. Two days, 153 miles, and no rain. I’ve only had to swear at cars twice. And I’ve not yet had to resort to universal digital signage. Tomorrow I turn north to find the Ruta de la Plata, or Silver Route. The ancient pilgrimage and commercial path runs parallel to the N630, which will take me all 807km to my destination of Gijón on the north coast. My best guess is that I’ll arrive a week from today, but who knows what’s in store along the way? My last two really big rides were to celebrate my 60th and 65th birthdays, so they were five years apart (O-Level maths, 62%, Fairfield Grammar School, Bristol, 1967). I did a few century rides in between, but nothing on the same scale as these continental adventures. As I approach my 66th birthday, it occurs to me that one big ride every five years means that there probably aren’t going to be very many to look forward to. My New Year’s resolution for 2018 is, therefore, to fit in two big rides every year. It’s time for the first one. The inspiration for this next ride, which will start from Faro in Portugal on Monday morning, 12th March, was Andrew P. Sykes’ most recent book. Entitled “Spain to Norway on a Bike Called Reggie“, it chronicles his journey from Gibraltar to a point so far north that it’s doesn’t get dark at night, at least in the summer. For convenience, I want to fly from Bristol Airport – it’s local – so I’m planning a slightly different route. I’ll fly to Faro in Portugal, stay at an airport hotel tomorrow evening, then turn right and head for the Spanish border. From Huelva, the first big town in Spain, I plan to ride into Seville for the night, then turn left the next day and cycle pretty much due north until I reach Gijón on the north coast of Spain, in the Asturias region. This route will differ from Andrew’s in that he cut north-east across from Huelva to Merida before picking up the Ruta Via de La Plata whereas I fancy a night in Seville to have a look around. Also, Andrew turned right just north of Zamora to head to Pamplona but his book mentions heavy traffic after doing so, and I don’t fancy that when there are said to be so many quieter roads for cycling in Spain. My current plan, therefore, is to keep going due north to Gijon and then figure out a way to get back home. Andrew P. Sykes’ route follows Eurovelo 1 through Spain. I’m planning to cycle along a slight variant of this, starting in Faro (just to the left of Huelva on the south coast of Portugal) and heading to Gijón on the north coast of Spain. However, “planning” is a bit of a misnomer because I’ll probably make quite a few changes as I go along. I’ve been a bit extravagant with respect to return flights. The original plan was to fly Easyjet from Bilbao to Bristol on Thursday, March 22nd. There’s just one flight per week on that route. However, Easyjet was also offering a flight from Asturias, near Gijón, to Stanstead in Essex on Wednesday, March 21st. It was £20, so I booked that too. Since then I’ve considered the option of flying back to Heathrow from Oviedo, which is about 30km south of Gijón, so I’ll already have been through it once. This has the advantage of being a daily flight, so timing is flexible. This is going to be a different kind of experience from the earlier big rides. I’m going to be riding a modern bike, rather than one of the vintage machines I used for the last couple of trips. The greatest difference will be having brakes that don’t make my knuckles go white on every steep descent. More about the bike later. Time to start packing. From the moment we set out, we had the feeling this was going to be a good day’s riding, and so it turned out to be. We had a slight headwind, which became stronger as the day went on, but by sticking with main roads we made great progress. The traffic was heavy and fast but we’d become immune to some extent and there was usually a hard shoulder to ride on, so we felt reasonably safe. The hills around Girona are long, sometimes a couple of miles or more, but not especially steep, so even riding with just a big chainring was not particularly difficult. Of course, we were tired by this point in the ride but the knowledge that this would be the final day kept us pedalling enthusiastically southward. We bypassed Girona on the N11 but on the south side of the city we hit the same problem we’d experienced the previous evening – the road became a motorway on which cyclists were not permitted. Coming off the junction, we searched for signs that might put us back on the road to Barcelona but could not find any. Even though we had a map, it was difficult to plot a suitable route to connect us to the C35 road we would need to take us towards our final destination. In desperation, we reverted to Google Maps and the outcome was just as we could have predicted – we ended up on a farm track in the middle of nowhere, even losing each other at one point as with skidded around the gravel covered lanes. Then we suddenly came across a cycleway, figured out where we were, and then did a five mile detour to bring us back on track. The sun was shining, we had time in hand, thanks to a relatively early 7:45am start, and found ourselves riding through forests on the minor GI-555 road before stopping for coffee and a sandwich at a delightful roadside garage where the owner and his staff were most curious about our ride. We stocked up on Madelines – tasty cakes – and carried on south to the C35. Only ten miles further on, we stopped for chips and Coke at a Burger King on the outskirts of San Celoni and set about planning the final part of our route into Barcelona. We had to add about 25 miles somewhere, otherwise we wouldn’t hit the magic 1000 miles for the trip. Our original plan was to cycle south of the city towards Sitges then turn around an come in from the south side. Surveying the map, we thought it may be better to get the final big climb of the day behind us while we were still relatively fresh, then make up the additional miles on the coast road, which we assumed was flat but turned out not to be totally so. We turned left onto the C61 to face the biggest climb of the whole ride, one far more challenging than scaling the Pyrenean pass into Le Perthus. The spike in the middle of the route profile gives some idea of knee-grinding endeavour it took to conquer the peak. I got to the top just ahead of Richard and took this shot of him coming to the highest point of the ride. The ride profile of the final day – the large peak is where we crossed the mountains north of Barcelona. After just over 50 miles, we were on the coast road for the rest of the day. The descent was a fantastic reward for our efforts and after reaching Arenys de Mar on the coast, we headed north for twelve miles to make up our mileage. A frozen yoghurt with fruit at Malgrat de Mar provided the fuel for the final 37-mile blast south into Barcelona. We had a strong headwind all the way and stopped every hour or so for a few minutes’ rest. At one point, I think I was first to spot the Spanish fleet en-route to invade Gibraltar – it looked like it may need some updating. Spain is clearly serious about its claim to Gibraltar – the armada is on its way! We had company for the last 30 miles. A French cyclist from Barcelona started chatting to Richard and rode alongside him. In fact, he wouldn’t stop talking until we paused for a while to let him get ahead. All we wanted to do was enjoy the view and the final few miles of our adventure. About an hour and a half from Barcelona, the only cloud in the sky rained on us. We got wet for about an hour but still had half an hour to dry out as we used the cycleways of the city to take us to our final destination in the old cathedral square. The sun shone again, the view was glorious and the roads were quiet for all but the last couple of miles. We arrived in the cathedral square to the sound of a live classical guitar performance and an America tourist from Virginia was kind enough to take our final shot of the trip. This was the day we expected things to get tough. We had the Pyrenees between us and Spain, and I had been particularly concerned that my bike’s gearing might not be low enough. (For the technically minded, I had a 48-36 combination of chainrings and the largest sprocket on the back was 28 teeth.) 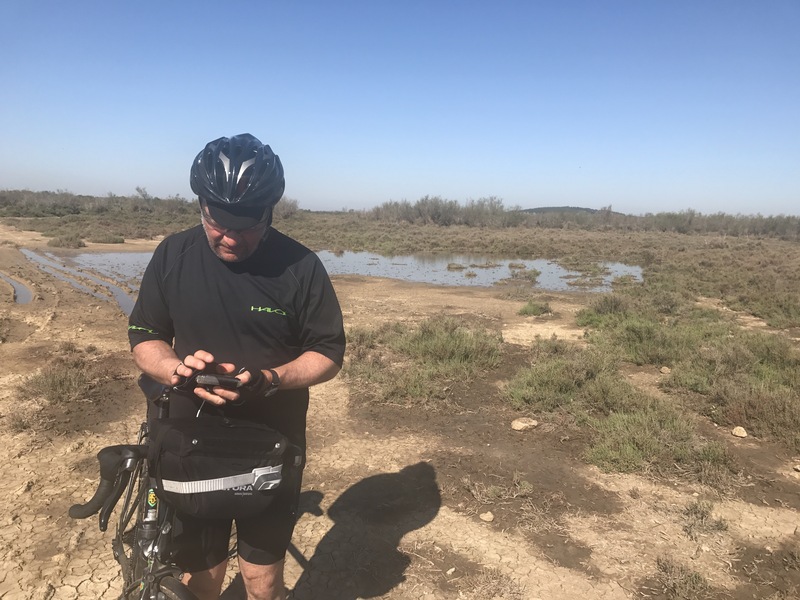 There is a cycleway that would have taken us south to Perpignan and through some great scenery but as we didn’t know how rough the surface might be, we decided to brave the main D6009 road. We had a tailwind and made great progress for 23 miles then stopped for a coffee and refuelling. A short distance later, the chain came off my bike and wedged itself between the crank arm and the chainring. We managed to fix it but ten minutes after there was an odd metallic tinkling sound. We pulled over. Some bolts had worked loose and my inner chainring had fallen off. It was dangling inside the outer chainring and there was no chance of finding the special bolts to fix it back on. For a moment, I thought this was going to be the end of the ride. It was Sunday – no bike shops open and in any case, none were likely to stock the parts needed to fix the problem. Using Richard’s last cable tie (cable ties are essential things to take on any extended bike ride) and some white insulation tape that I carry with my tools, we taped the errant chainring to the bike so that I could at least ride on the large one, the one that produces higher gears and makes hills even more challenging. The next few miles were on the flat and we enjoyed a helpful tailwind so made good progress. We were on the main N11 for our climb from Le Boulou on the French side of the Pyrenees to the border town of Le Perthus. I’d been dreading this but it turned out to be less demanding that I’d thought as Richard and I battled slowly up the climb. Relieved to be at the top, we stopped for chicken and chips to refuel. Our destination for the day was Girona and we still appeared to have time to get there as we left Le Perthus. However, the wind changed direction and it wasn’t long before we were head-down fighting to maintain a decent speed. We stuck with the main road and it was busy but we couldn’t countenance the prospect of being sent into the wilderness again by Google. There were long steady climbs relieved by the following descents. The headwind drained our energy and our speed so it was about 8:30pm and just beginning to get dark when the road, at least for us, was ended abruptly with a “no bicycles” sign. It was becoming a major dual carriageway. Worst still, the original old road was blocked by cones because there was major construction work in progress. We didn’t know which direction to take and, to make things worse, the battery on my headlight was flat, so I had no front lighting. Looking across the junction, we could see a hotel. We were ten miles outside of Girona, our original destination, and had covered 96 miles by the time we reached the door of the hotel, slipping four miles behind schedule with one day to go. The hotel looked closed but when we used the intercom, we were greeted by a woman who came out onto a balcony and asked what we wanted. We explained our predicament and she tried to tell us which road we should take but we were unconvinced, exhausted and ready to find a bed for the night. Our host opened the hotel, made us filled baguettes, salad and fresh fruit for dinner and asked us what time we wanted breakfast. It was an extraordinary welcome considering we were the only two guests at the hotel, arriving at nearly 9pm on a Sunday evening. She could so easily have simply turned us away. The following morning we had a 7:30am breakfast of coffee and croissants then headed over to the road junction that had so confused us on the previous evening. There was a construction worker at the entrance to the blocked road. We asked him how we could get to Girona and he told us to ignore the “no bicycles” sign because just a kilometre along the new road it joined the old one and we would be fine. So that’s exactly what we did. This was supposed to be the easiest day of the trip. It had come about because we decided a couple of days ago to end the trip in Barcelona, as originally planned, rather than head over to Majorca to do the last 100 miles there. With our target of 1000 miles in total, we needed to add some during the trip. Basing ourselves in Narbonne and doing an out-and-back trip seemed like a good idea and it meant we would travel luggage-free for a day It should have meant the opportunity to add more miles, leaving us fewer to do in the final two days. We resorted to Google again for directions and all was well when we set off. Almost immediately after leaving the built-up areas of the city we were riding on small but well-surfaced country roads, some of which ran through vineyards. It didn’t last long. Before long we were being directed along almost non-existent trails and finally ended up with nowhere to go in a swamp. We backtracked, losing an hour of cycling time and the rest of the day saw numerous repetitions of Google Maps’ inadequacy. It does state the cycling routes are in ‘Beta’, which means still being tested. They can be useful going through towns but are pretty much useless in the French countryside. Anyhow, in the end, we reached Cap de Agne, had a quick look around, then headed back. We used our printed map in the main, navigating carefully between small villages to find the most direct route back to Narbonne from a tangle of country lanes. We got back at 9pm, more tired than we’d ever been and with just 90 miles to show for it. Our buffer of 10 miles from the previous day was gone but at least we were still on target – 8 days and 800 miles into the trip. This was supposed to be an easier day. 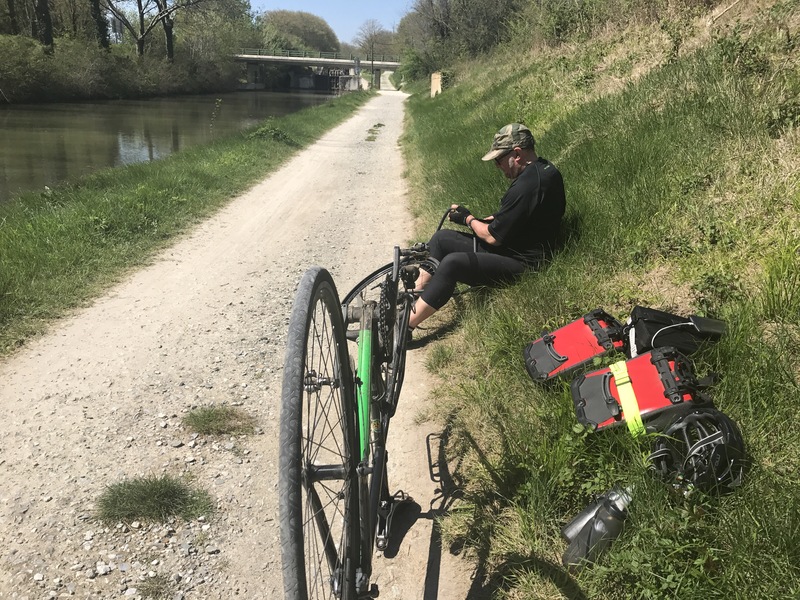 We had 100 miles to cover on the Canal du Midi cycle path, heading almost due east. We had a northerly cross wind in the morning but it was forecast to turn westerly in the afternoon, creating a helpful tailwind for the ride. In the end, it turned out to be as tough as the previous day. We both had big dips in energy along the way, Richard’s coming early in the ride, mine much later. As soon as we left Toulouse, the cycle path deteriorated into something more like a mountain bike trail and not only did this bring our average speed down to single figures in mph, but it shook us about on our rigid road bikes and required a lot of concentration to avoid tumbles. Despite this, we felt we made reasonable progress and stopped for coffee at a converted lock keeper’s station along the canal. We sat outside in warm sunshine and it was apparent that we were now in the south of France. We then set out again but the cycleway progress was slow – it was just too rough. We stopped at a lovevly restaurant and had pizza for lunch. It’s great cycling fuel. We were chatting to a French couple next to us who had moved to the area from Paris just two days earlier and time flew. I guess we must have been there for an hour and a half, but we were unconcerned about time. As soon as we set out again, we knew we were going to have to up the pace as the canal path surface deteriorated again. Richard then had his third puncture of the trip – he now leads 3-1. It set us back another 30 minutes and we headed off once more. At this point we met a French family on British made Genesis expedition bikes (Croix de Fer models). The father had a trailer to carry the couple’s daughter, who was perhaps two years old. His wife’s bike was fully loaded too, and their luggage included campaign equipment. They had set out two days earlier from Toulouse and were on their way to Norway via Italy, Switzerland, Germany, Holland and Denmark. This was to be a six-month trip and it made our little challenge seem easy. We decided to turn back and find a road route, abandoning the canal path. We ignored the first ‘route barre’ sign we came across – something which normally means you have a traffic-free section of road to ride on and can then squeeze through a gap somewhere at the end with a bicycle. We made a wrong turn at one point and ended up heading down a cul-de-sac where the house at the end was guarded but two barking dogs. We’ve seen dozens of guard dogs behind fences on our trip, but these were not fenced in and started to charge towards us. Our ride is recorded on our GPSs and i think when we analyse it, we’ll find our time for the 400 metres or so after the dogs headed our way will qualify Richard and I for the next Olympics. I’ll write to British Cycling. Escaping without in jury, we then found the road to Narbonne via Carcassone, the latter being about 15 miles away. We switched on Google Navigation and got through Carcassone but just as we were leaving the city, we spotted the French family beside the road and gave each other a wave. How they got there ahead of us with a trailer in tow, we’ll never understand or find out! The road was now busy and only a narrow white line separated us from the traffic thundering by, some of it uncomfortably close. We pushed on through the last 40 miles making good speed with the promised tailwind and there were only two diversions from the D6113 indicated by Google. The first of these led us along a lovely country lane through Crobier vineyards but then dumped us an impassable 800m rutted and wet track. 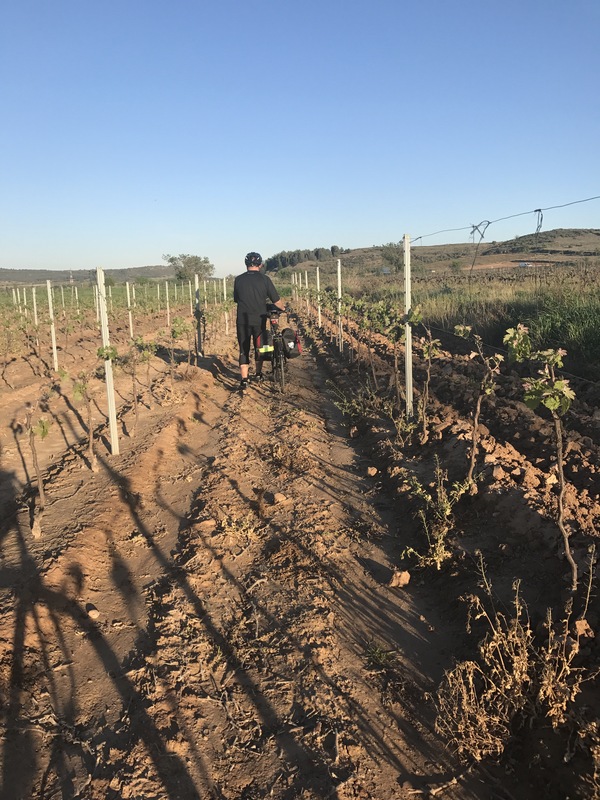 We had no option but to wheel the bikes between rows of vines hoping that the owner did not let his dogs loose – we could hear their frenzied barking behind us. A final push and we arrived in Narbonne just after 9pm. Another pizza, accompanied by desert and wine this time, and we were done. We’d covered 103 miles putting us 10 miles ahead of our 700 mile target for the end of the seventh day of our trip.